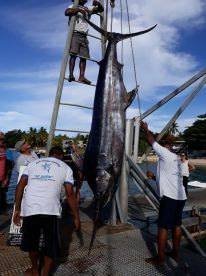 The preffered style of fishing is trolling to catch the Predators of the Indian Ocean, but jigging and popping around the northern Islands is successful as well. 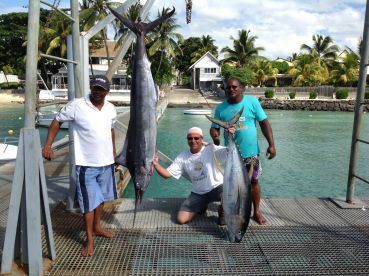 2 Blue Marlins, 3 Sailfish ...."Le Dodo"
Double Strike for "Le Dodo", 2 Blues ! 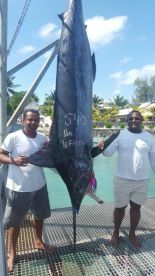 540 lbs Blue Marlin for "Le Dodo"
Dorado Day at "Le Dodo"
Rough weather but we've got Dorados ! 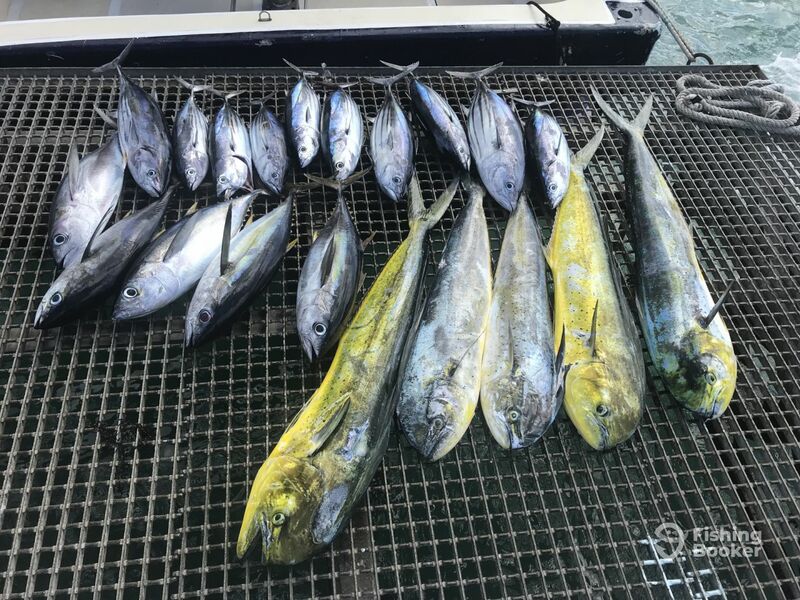 Even more Yellowfins for "Le Dodo" ! 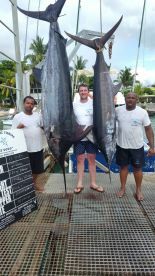 "Le Dodo" catched Blue Marlin and Tuna ! 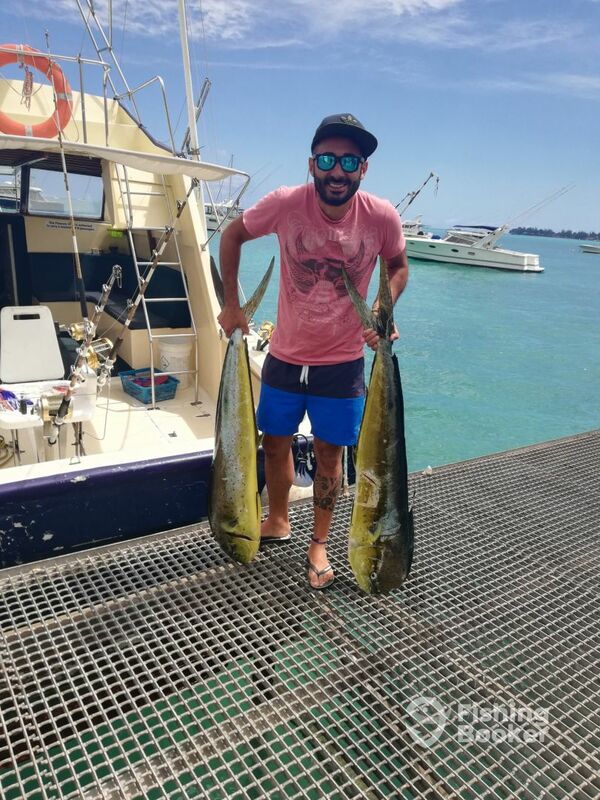 Le Dodo caught some nice Wahoos! 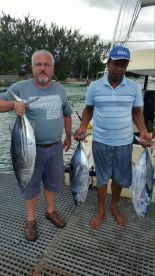 "Le Dodo" catched huge Skipjack Tunas ! "Le Dodo" catched one ! "Le Dodo" goes Yellofin ! 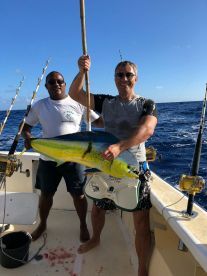 "Le Dodo" after Christmas catch ! 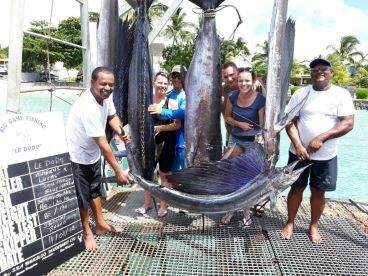 Great fishing day on "Le Dodo"
Great fishing and a lot of fun! 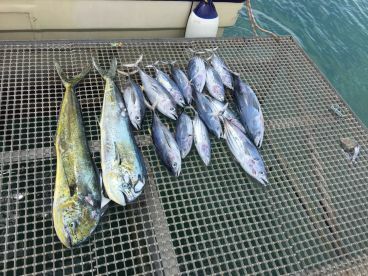 5 Dorado, 15 tuna during 4 hours - everything was perfect! Professional and confident team, maybe not enough communicative, but the main thing is trophies I think. 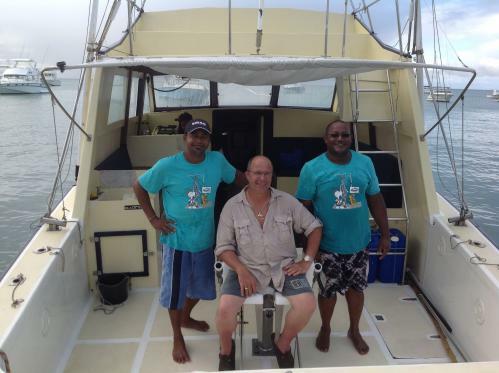 Friendly crew, great boat, with equipment suited for big game fishing. The only small request for the future is I would have enjoyed fighting the smaller catch with lighter gear. Except for that, my son and I loved it!!. 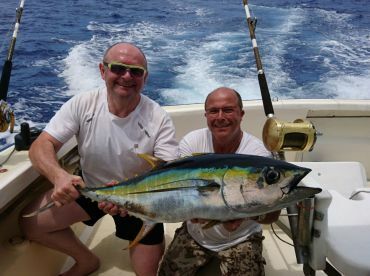 Friendly crew, great boat, with equipment suited for big game fishing. 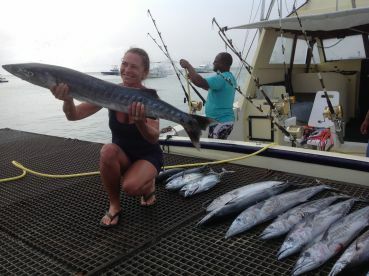 The only small request for the future is I would have enjoyed fighting the smaller catch with lighter gear. Except for that, my son and I loved it!!. Thank you. Hello, thank for being abroad our boat and for your comment. We wish you a good stay and maybe see you next time. It’s a pleasure for my team and I that you enjoy your trip with your son with Us. Hello, thank for being abroad our boat and for your comment. We wish you a good stay and maybe see you next time. It’s a pleasure for my team and I that you enjoy your trip with your son with Us. Best regards The Captain. 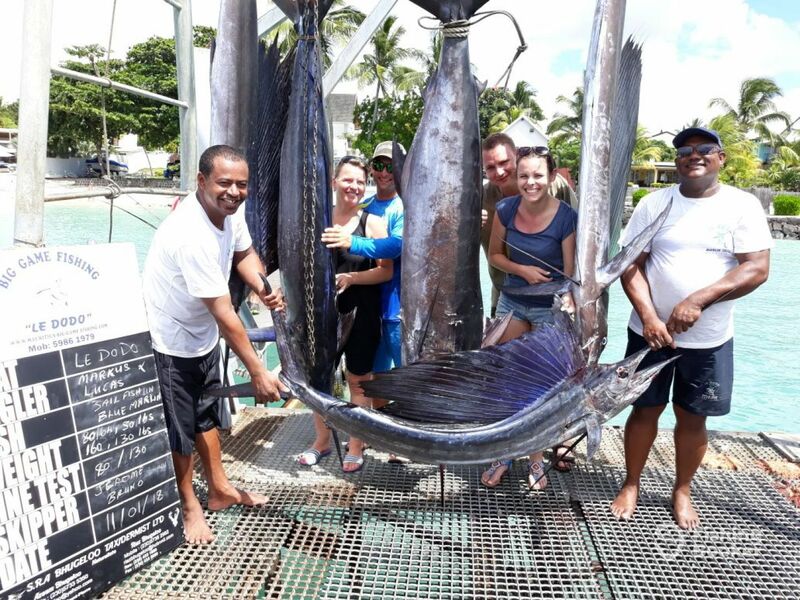 11th of january2018 was absolutly cracy.At 6.30h we start fishing up to the North.On the way we catch two small tunas.When we arrived the famous EMILIA BANK we got a massive Sailfish-triple hookup.With 9 lines in the water the chaos was perfect.But with the help of Jerome and Bruno we got all of them. 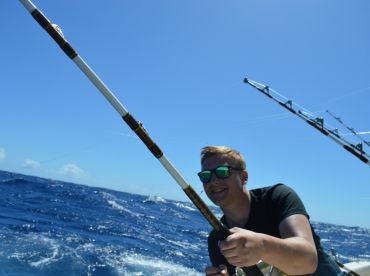 I shared the trip with a nice couple from poland.It was a perfect start for Lucas at his first offshore fishing trip ever.But it was not enough…. 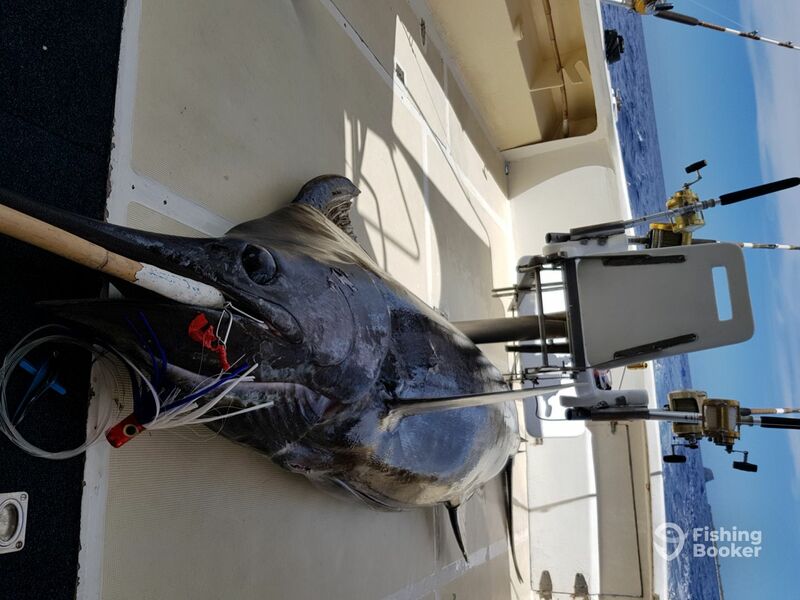 After one hour trolling we get the next Action.The result was a nice Blue Marlin. 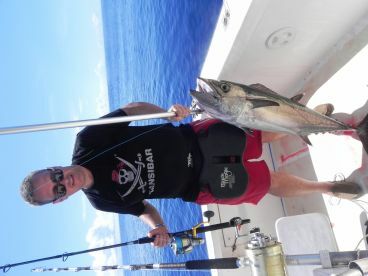 -no time to celebrate,lures back in the water the Show must go on. 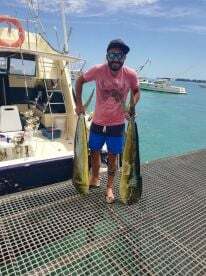 One hour later Lucas was in fight with his first Blue Marlin.After a hard fight we had our second Marlin in the boat.Now it was time to celebrate,we had a lot of fun. 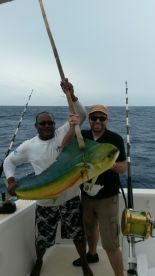 Best fishing experiance of my life! 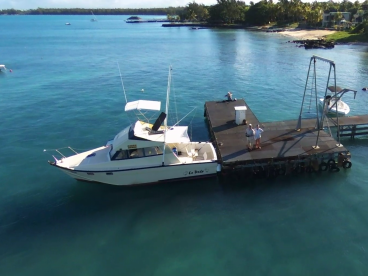 The crew picked us up at our hotel and drove us to the boat. The boat was already prepared and was ready to go as soon as we arrived. The crew was changing lures all the time and always looking for signs of fish. 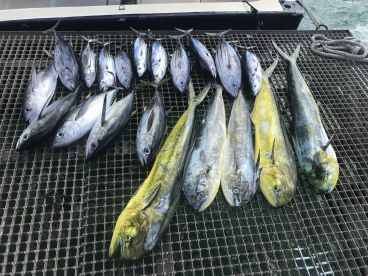 After a while we got a few yellow fin tunas on the hook and the fishing was underway. It was very exciting! 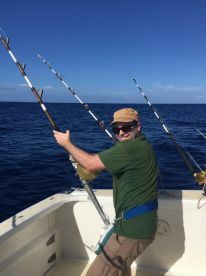 Then a marlin caught the lure and the fishing experiance went from very good to best of my life. 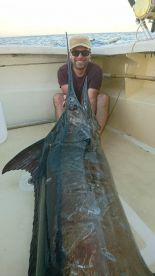 The big marlin gave areal fight and the crew, Bruno (acted as my personal trainer) and Jerome steered the boat. 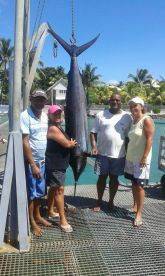 After 1,5 hours we had landed the marlin! Bruno and Jerome was extremly professional and knew exactly what to do and guided me in every step. I can really recommend this trip. The service, the professionalism, the sixth senes of the crew made this a experiance of a lifetime! Thank you! 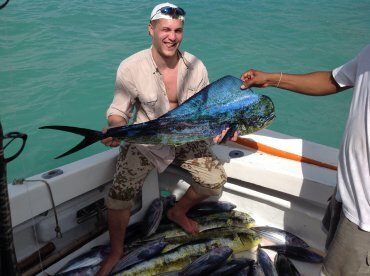 If you love fishing it’s a must to take this fishing trip.